Innovation – what exactly is innovation? Innovation, like strategy, is constantly talked about yet greatly misunderstood. Government and business alike talk of innovation as driving economic growth. Innovation is a Holy Grail. So what is it? I think that the best definition is ‘an idea that is developed and implemented to bring something new into being’. Lots of people confuse ideas with innovation. I have this great idea for a self-cleaning car. Am I not innovative? Unless you build the self-cleaning car, I don’t believe that you are. Ideas are easy. We all have ideas all the time. To be innovative the idea itself does not have to be novel. However the product, service or system you develop as a result should be. The key thing is to bring something new. It could be a very small increment over what has existed before. It could even just bring together a collection of already existing things into a new package. For example this year’s model of car will be an incremental innovation over last year’s model of the same car. It could be that all the parts existed last year. The innovation is that this is the first time they have all been in the same production model. Not all innovation is incremental. From time to time radical innovations appear. These change a lot of things all at once, including the non technical elements of the product, service or system. 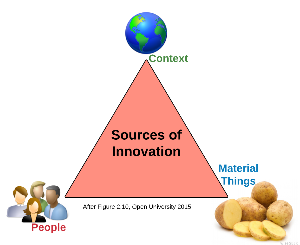 What are the sources of innovation? There are three main sources for innovation, although more than one of these can be innovated on at a time. There is also the level at which innovation is made, the product, the service, the system or a meta level. People, materials and context. These are fairly self-explanatory. Material things cover where a physical products is created or improved. This is possibly one of the more common sources of innovation, the constant tinkering to make it easier to use, more effective in what it does or easier to manufacture. People covers who uses it, either bringing new people in, or possible finding new ways to use an existing thing. It could be combined with a material change to widen the market for something. For services a better understanding of user needs drives improvement. Context is the setting in which things are used. Innovations driven by context are often about taking something from one context and applying it in another. For example one might take the meals on wheels concept (hot food delivered to older people) and instead use it for busy workers who need to work late. Can Dan Gurney’s Moment-Cancelling engine breathe new life into internal combustion? The Way of the Future-Doomed to Slow Economic Growth? This entry was posted in Study and tagged innovation, Open University, T317 by James. Bookmark the permalink. ← Previous Previous post: Brexit – what will the European Union do?